Tis the time to get your summer groove on!! Over 120 HEARTY HAPPY RACERS did just that over the weekend outside of State College, PA in the Rothrock State Forest. They rode all over the mountains deep into the lush "tasty green" backcountry of central PA during the Stoopid 50 Mile Race and Ride Weekend. The Mt. Nittany Wheelworks boys and the Nittany Mountain Bike Association did an awesome job behind the scene getting the course and logistics for the Stoopid 50 all dialed in. The event showcased so much sweet singletrack closer to State College that the 101 doesn't even touch. 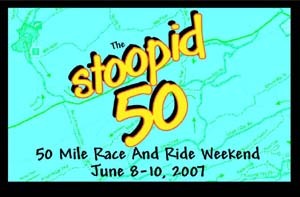 Thanks to everyone who helped make the 2007 Stoopid 50 fly!! - volunteers, racers, and sponsors!! - Cathy, Jimbo, Karin and Kelsi Randall, Frank, Harry, Kevin Bergman, Ray Crew and my parents!! !